Update: Here's my take on these adorable baby gifts! Or looking for a unique baby gift (that you don't have to make yourself!)? Take a look at my new line of onesies from CSW Designs! Choose your animal, color and pattern (chevron or polka dot). Perfect for the little ones in your life! And no, this is not a post announcing that I'm jumping on the bandwagon ;). I'm so, so excited to welcome each one of these precious little ones into the world, and to celebrate their arrivals, I want to give them each a little gift (spoiler alert to my pregnant friends!). 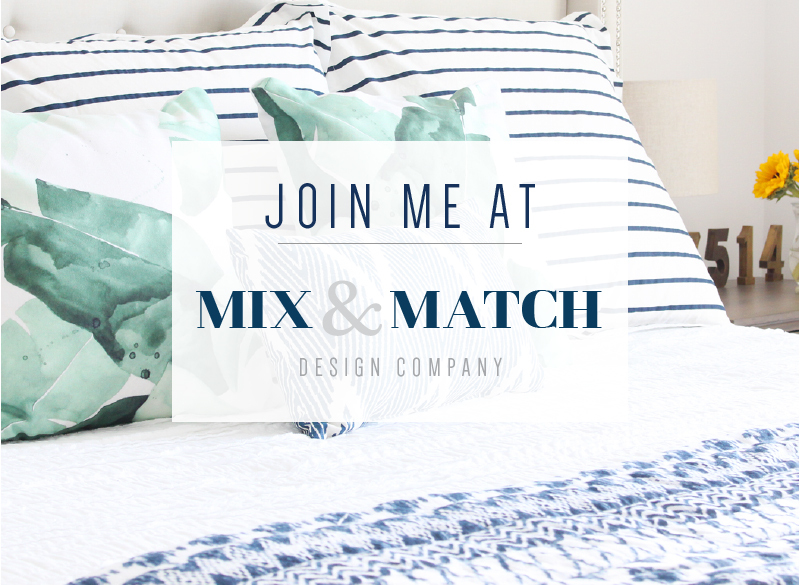 If you've read my About Me page or this blog for any length of time, you know I'd rather DIY something than buy it, so I'm planning to make something. 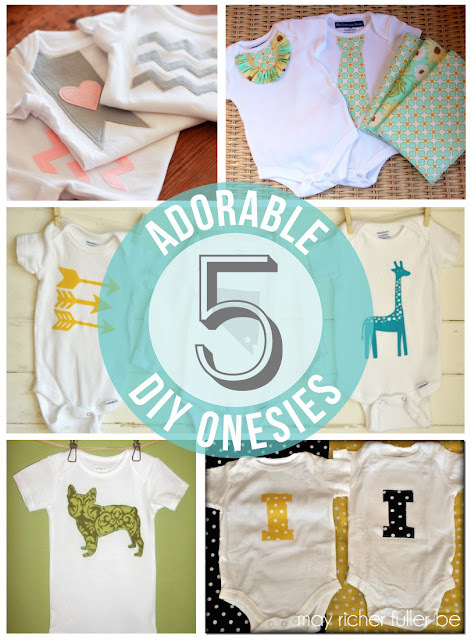 One of the most adorable ideas I've come across are customized onesies. 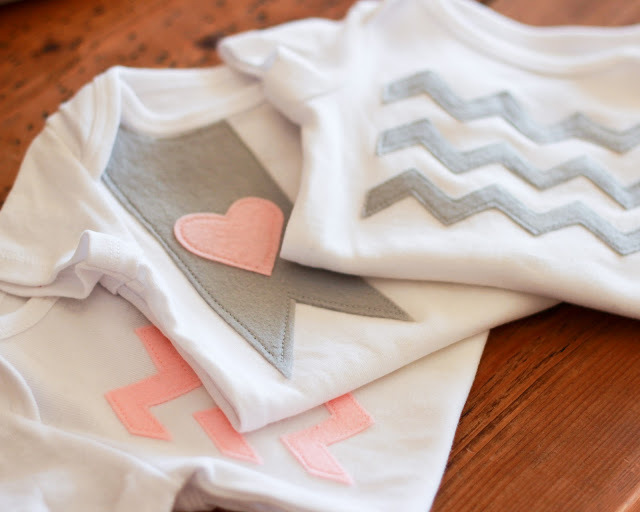 Whether appliqued with fabric, screen printed, stitched or stenciled, they're just plain cute. The design possibilities are endless, but I wanted to share five that caught my eye and provided some inspiration for designs I'd like to try myself. 1. Appliqued felt onesies from Finley and Oliver. Chevron stripes? Yes please. There's even a template you can download for the chevrons, which makes this project super straightforward. 2. Appliqued tie and bib onesie from The Cottage Home. These two were made for a set of twins (boy and girl) and the tutorial for this one is fabulous! Lindsay made matching burp cloths too - another adorable baby gift idea. 3. Heat transferred onesies from Bullfrogs and Bulldogs. Amanda used a Silhouette machine to cut out her designs, but I'm pretty sure you could do just as well with scissors and the freezer paper screen printing method :) (I like this tutorial best). 4. Appliqued bulldog sillhouette onesie from Martha Stewart. Oh Martha, I can't leave you out of this post, now can I? The small scale fabric she used works beautifully for a silhouette here. 5. Appliqued monogram onesie from Decor and the Dog. 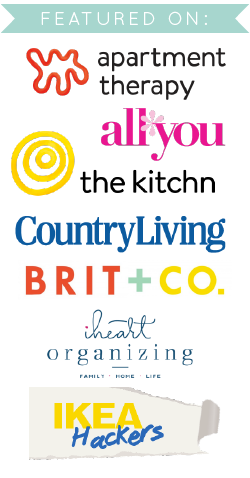 Monograms are always adorable and personal, especially for the preppier/southern crowd, and this one is no exception. I'd probably make a three letter one with the little one's initials out of some some cute fabric. Now tell me these aren't the cutest little things. The possibilities really are endless. Is your head spinning with ideas yet? These are just a few of my faves. I can't wait to try a few designs out this weekend. The onesies have been purchased...now I just need to figure out what to put on them! Psst...you might've notice that the blog now has its own domain name: www.mayricherfullerbe.com. Yippee! Nothing's changed - you'll still get here if you type in the blogspot address, you'll just be redirected automatically to the new address! Update your bookmarks! So cute! I may attempt these... I've DIY'ed girly hairbows for a baby gift, but never onesies (at least ones that turned out okay)! ahhhh… just packed up my little man's last onsies and it makes me miserable :( Guess I'll simply need to make loads of onesie gifts for my friends who are crazy enough to have more than 2 children! 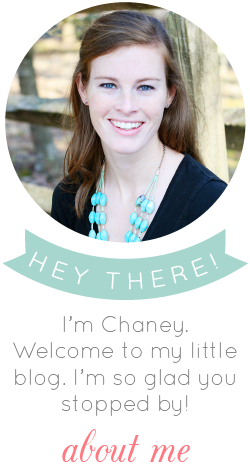 Haha.These are so lovely Chaney,pinned!